Sometime in the beginning of April, Ryan went on a gardening kick, filling our little bedroom patio with pretty little plants. I, on the other hand, have NO green thumb what so ever. In fact, whatever the opposite of green is, that is the color of my thumb! But, I was jealous of the little patio paradise and thought I would give it a try. Off to Home Depot I went! My mom was in town at the time, and she is always very encouraging, that is probably the thing that actually got me up and planting. Together we bought some seed starter pods, a pack of mixed hot pepper seeds, and some tomato seeds. And we went home and they sat on my table for a week. 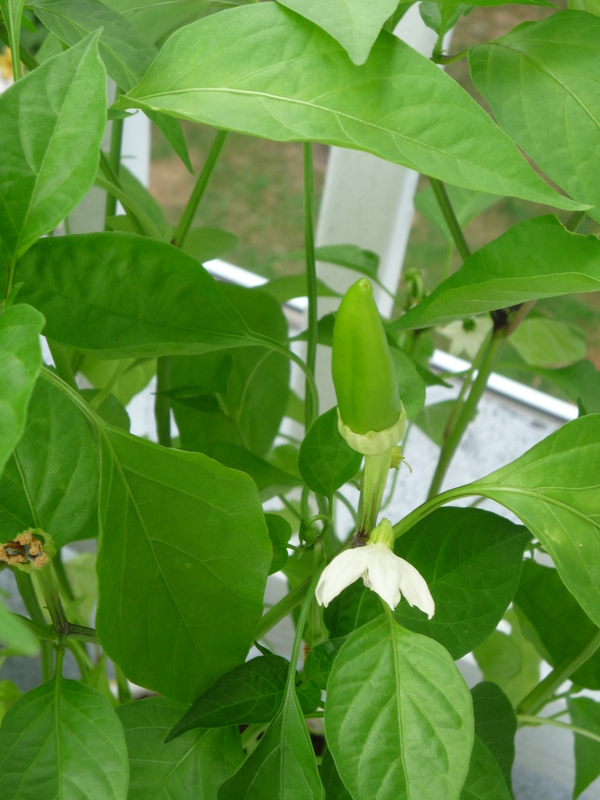 Mr. Green Thumb (aka Ryan) gave me the planting push the next weekend, and I finally put my peppers in their pods. I was fully expecting nothing to happen and to be throwing them away in a couple of weeks. 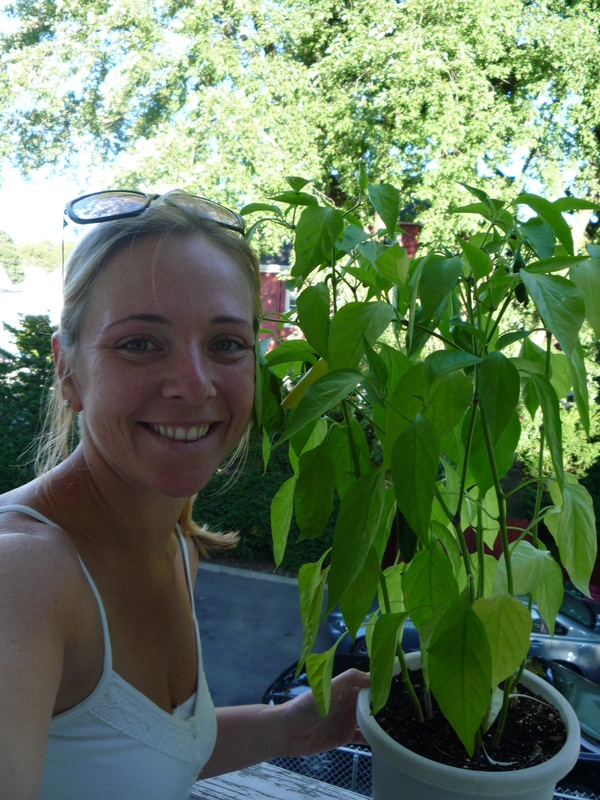 Imagine my surprise when 3 weeks later I was transplanting baby plants into pots!! 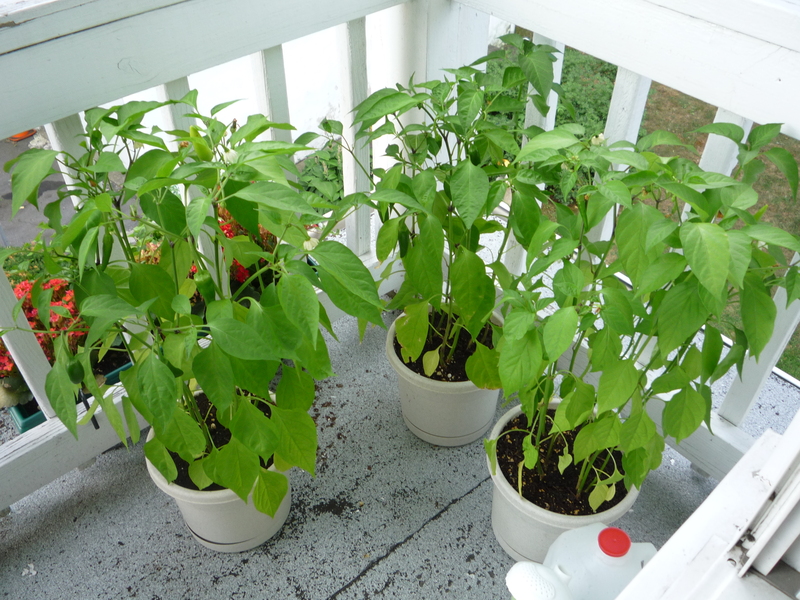 I was still in disbelief that this would really work, so I self-sabotaged myself by planting 3-4 seedlings in each pot. And off they went to the paradise patio. A couple of weeks later, it turned freakishly cold for that time of year. I thought for sure this was the end of the little plants that could. The weather, coupled with the fact that I “occasionally” forgot about the plants did not seem like a good combination. But all that time, Mr Greenthumb took care of the babies without my even knowing. Making sure they were watered and fertilized. Again, shock was on my face when the weather warmed, I looked outside, and there were flowers on my plants! Better yet, there were little green veggies growing out of the center of those flowers! It was one of the most amazing feelings. We had done it! We had grown something that we will eventually be able to eat! From that point on, I assumed my caretaker duties and it was game on! 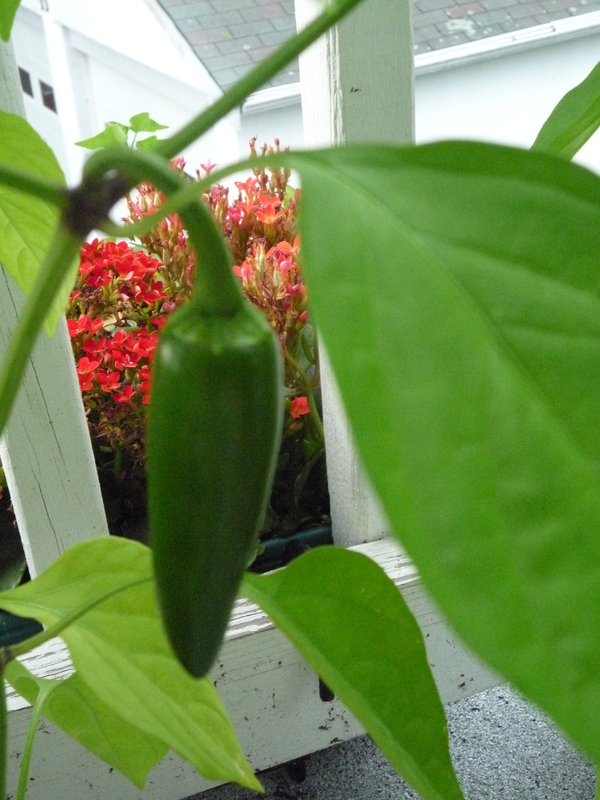 I dried them out at certain times to make them spicier, I fertilized them when needed, and finally, when it was time to pick my first pepper, I flushed the plant. Such the little farmer I had become! Can you believe that today, including the 4 peppers I have picked, we have 28 peppers! And there are over 30 that are still budding! I certainly can’t believe it. 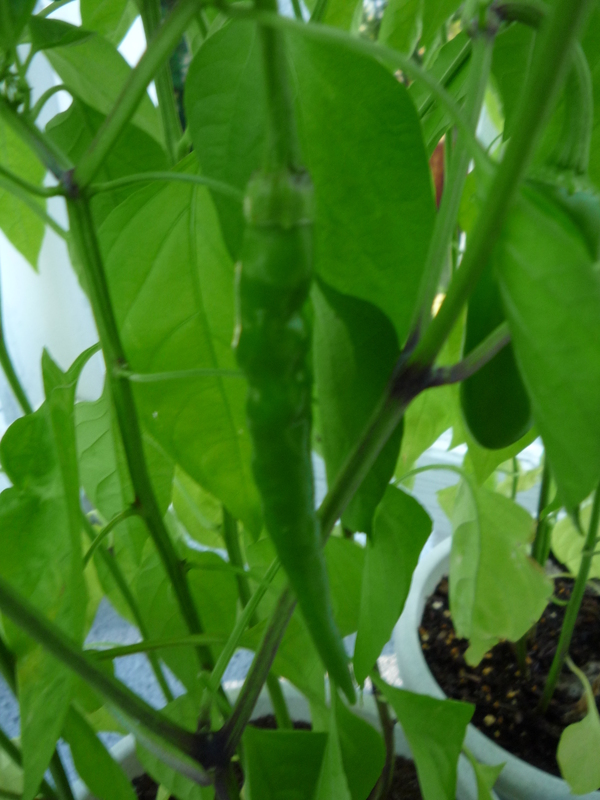 There are 4 types growing, the only one I can ID is the jalapeno (which is super spicy). 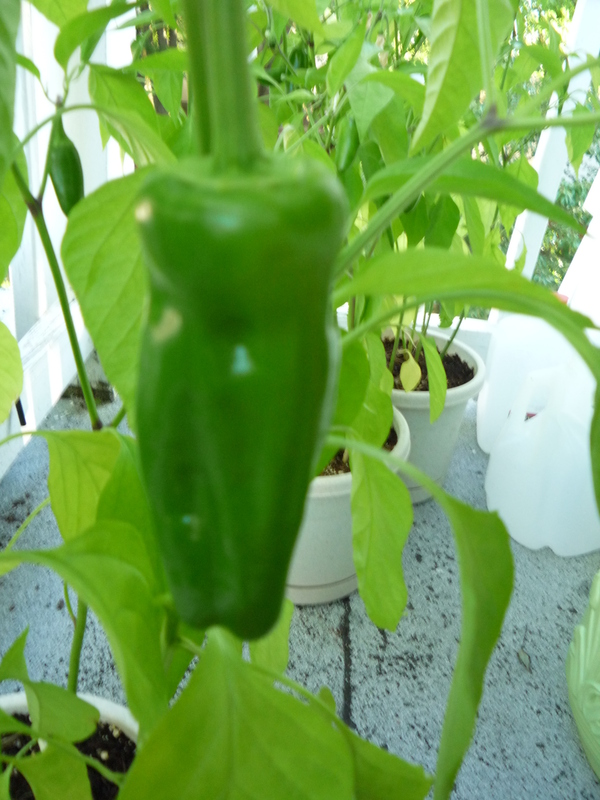 There is also one that looks like a poblano (only one of these grew, probably because there was not enough root room), a long skinny pepper w/ bulges and a darker green color (maybe a cayenne? 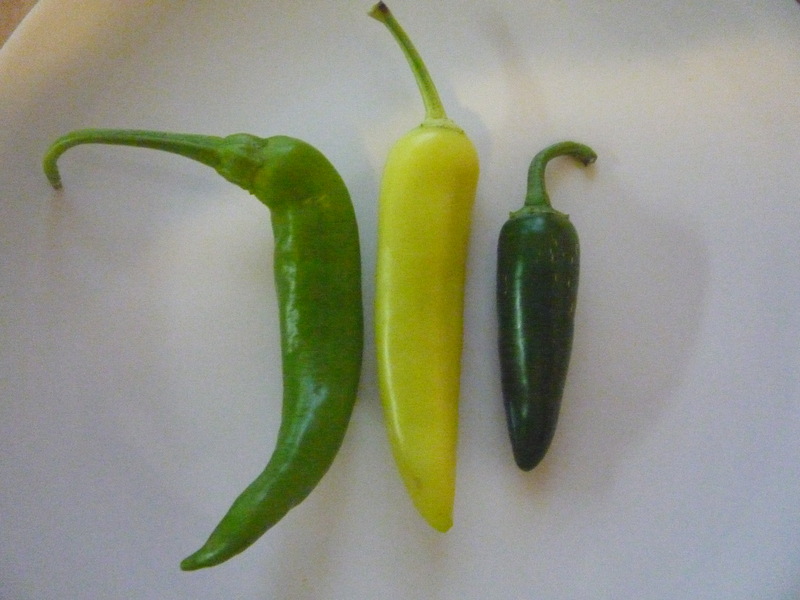 ), a longer yellow-ish pepper that grew straight up (looks like a pepercini), and one more type that is only beginning to bloom now. 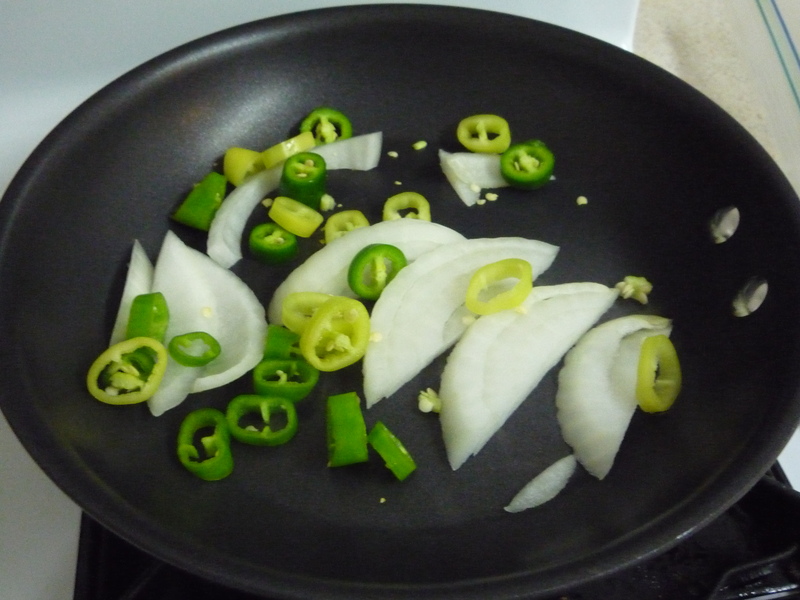 But then the pressure of deciding on the perfect recipe to try my new peppers set in! It had to be perfect! Enter Big Bertha! Ever since I bought her I have been dying to sear a steak. Steak & peppers it is (see recipe below)! Wow! Oh my goodness! Holy cow! It was one of the best meals I have had in ages. And it was so simple! 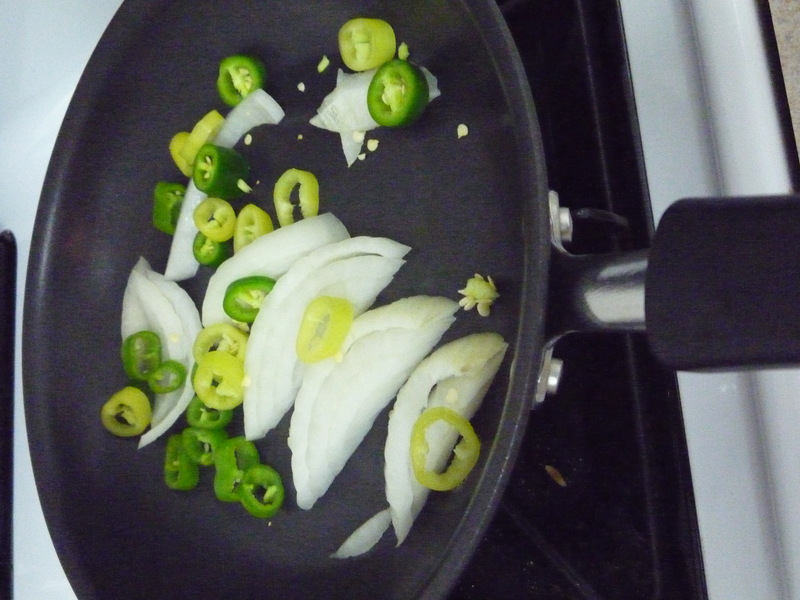 But the combination of the straight-from-the-plant peppers, and not having to use oil in my new pan, made it unbelievable! So what do I take away from this experience? Well, I realize how fulfilling growing your own food can be. Not only is it more delicious, but you really get a feeling of self-fulfillment. You feel like you can do anything if you can create a meal from a seed! I know, it may sound silly, but it 100% true. And yes, we already have the entire planting blue plant for the paradise patio for next season! 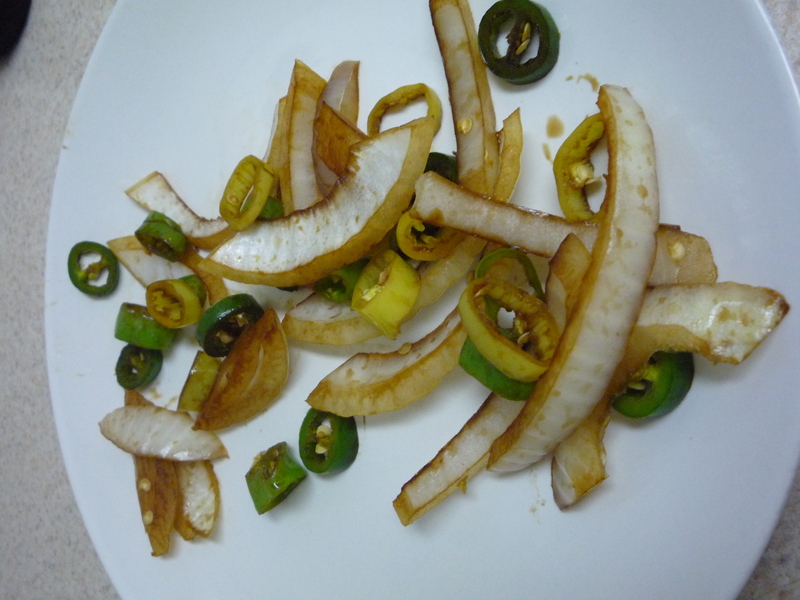 This entry was posted in 101 Blog, Recipes by reneeh. Bookmark the permalink. 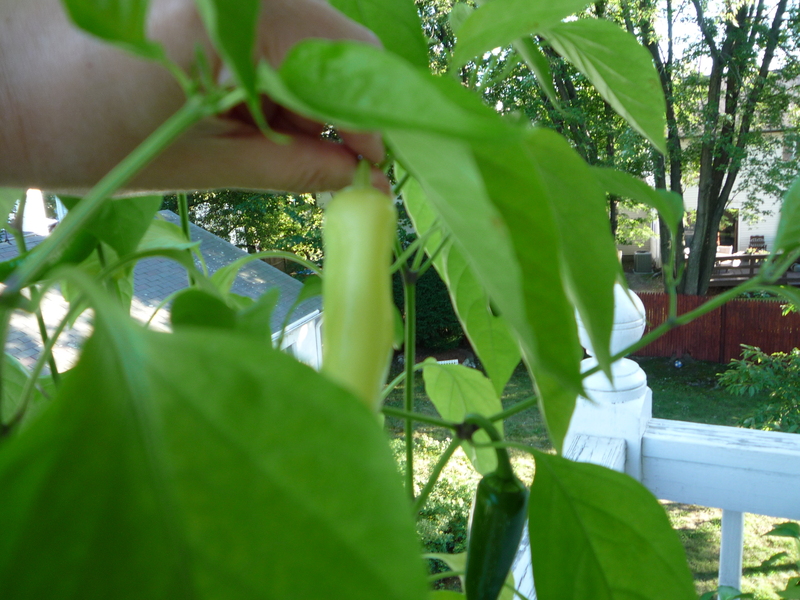 It’s funny to see your peppers up here – last summer I went all out trying to grow tomatoes, squash, brussel sprouts… and all that really grew were the jalapenos. Resilient suckers! (this year I stuck to herbs) Glad you had some success!